De humani corporis fabrica of 1543, by the Flemish anatomist Andreas Vesalius, threw Renaissance anatomy into a tumultuous chaos, and ultimately overturned Galenic doctrines that had survived from the 2nd century—over 1300 years! The sublime anatomical figures of Fabrica are today widely recognized and admired. But few among us have given much notice to the historiated initials, the large blocked letters of the alphabet featured at the beginning of important sections and paragraphs. In a very real way, they are simply hiding in plain sight. But Dr. Lanska discovered that they have a tale to tell and he will reveal the reward of giving them closer scrutiny. 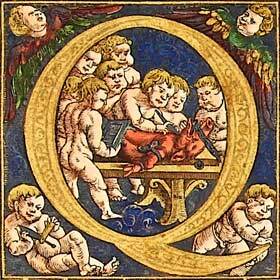 At first glance, the historiated initials seem rather cartoonish in comparison to the graceful anatomical figures. Indeed, some are plainly vulgar and convey Vesalius’ macabre humor. But they also vividly portray the sordid details of the anatomist’s work, the methods Vesalius used to gain the knowledge presented in the anatomical plates and text. Plan to join us for this fascinating historical discovery of the medical past. Dr. Lanska is Professor of Philosophy and the History of Medicine at the I.M. Sechenov First Moscow State Medical University in Russia. He has been Professor of Neurology at the University of Wisconsin and the University of Kentucky, Clinical Professor of Psychiatry at the Medical College of Wisconsin, and Chief of Staff and Associate Chief of Staff for Education at the Tomah VA Medical Center.